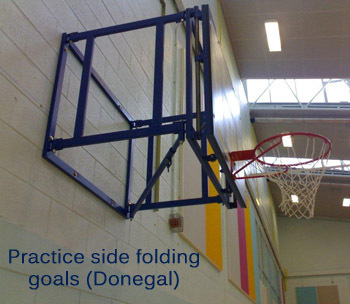 After over a decade of supplying and fitting indoor basketball units for Irish schools, GAA clubs and community centres, these units can be broadly broken down into two principal categories; Main and Practice basketball units. These basketball units are usually found on either end of a sports hall and will facilitate competitive basketball matches. 1. Motorised ceiling mounted basketball units. Dept. of Education specification (PE/594/31) with 1800mm x 1050mm Perspex boards, safety padding, spring loaded rings and brake cable safety devices. This basketball option facilitates National League competitive basketball games and will retract back towards the ceiling when out of play. Most schools and community centres we have dealt with over the years would ideally prefer this option. 2. Main wall mounted units with Perspex backboards & spring loaded rings. Main wall mounted side folding 1.75m up to 3.75m, 1800mm x 1050mm Perspex boards, safety padding and spring loaded rings. When the ceiling mounted basketball option is not possible because of the sports hall structure/design or budget constraints we have installed these basketball units for a number of venues. National League basketball matches can be played using this specification. 3. Main wall mounted side folding units with timber backboards. Main wall mounted side folding units 1.75m up to 3.75m with 1800mm x 1050 timber backboards. Schools & sports venues on a tighter budget maybe wish to forgo the Perspex backboards and break away rings while still being able to play competitive basketball matches. This indoor option however is not to National League standards. 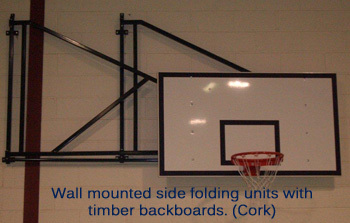 These units’ backboards are always the smaller 1200mm x 900mm and will be found on a sports halls side walls. There are normally four units in each sports hall for players to practice and hone their basketball skills. 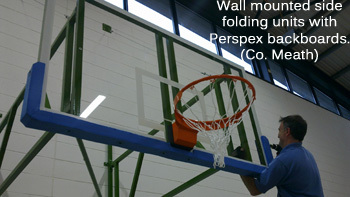 Wall mounted practice side folding goals with up to 1.5m extensions and standard indoor basketball backboard, 1200mm x 900mm. These types of practice units with extensions of up to 1.5m from the wall allow players to practice their run up techniques. The units fold away either vertically or horizontally when not in use. They can also be fitted with height adjusters as an optional extra. 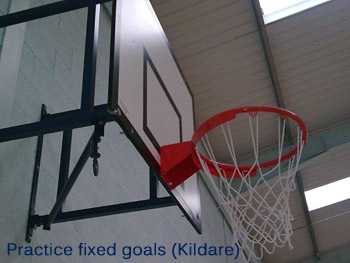 Wall mounted practice side fixed goals with up to 1.5m extensions and standard indoor basketball backboard, 1200mm x 900mm. Again these types of practice units with extensions of up to 1.5m from the wall allow players to practice their run up techniques but remain in a fixed position from the wall. The height adjustor optional extra is again available for this indoor practice option. 3. 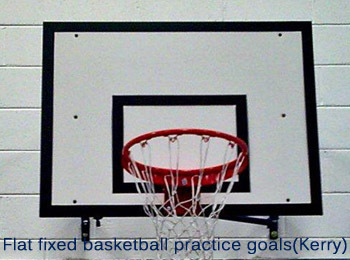 Flat Fixed Basketball Practice Goals. Standard indoor basketball backboard, 1200mm x 900mm, timber battens to suit. This practice basketball option is chosen when budgets are tightest but a school or sports facility still wants its players to practice their basketball skills. As there are no wall extensions, players can’t practice their run up techniques. Basketball line marking Outdoor basketball units. If you require more detailed indoor basketball information or pricing please do not hesitate to contact us, email our marketing manager; niall@fitnessfunctions.ie, visit our website www.fitnessfunctions.ie or low call us on 1890-252-856. We look forward to hearing from you. Over the past 10 years we have supplied and fitted countless netting systems in sport halls throughout Ireland for schools, GAA clubs, community centres and sports clubs. These indoor netting systems allow sporting venues to divide their sports halls in various ways to optimise space and play numerous games/sports at the same time. We also supply netting for golf clubs and centers for indoor and outdoor applications. Department of Education Divisional Nets. Divisional Net c/w Hanging Bag. Hall. . Flame retardant canvas and netting. shuttles etc. to adjacent courts. Extruded aluminium section. Length determined by size of hall. PE Supplier to confirm that this is so. 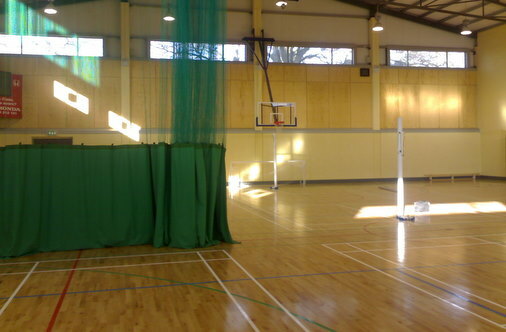 Each sports hall in Ireland is unique and as such, the divider netting fitting & installation is customised to suit the individual sports venue dimensions and requirements. Fitness Functions has carried out hundreds of projects direct from the Department of Education School Sports 406 and 594 packages, the Department allows for 7 courts to be painted for sports activities. In general, we believe teachers should be aware of the following 7 factors. If the school has enlisted the services of a professional line marking company ensure the hall isn’t treated with detergents and soaps beforehand. The best preparation is to simply sweep the hall clean and ensure its as ‘dust free’ as possible. 2. Save Money/Value for Money. 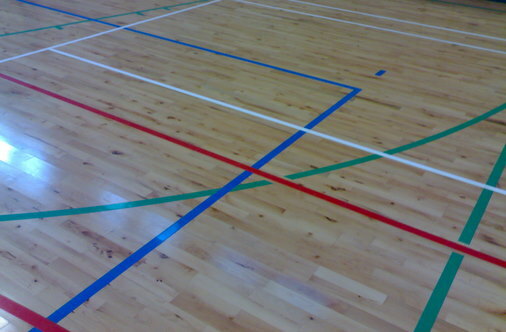 We are often asked how much it costs to line mark one sports court for a school. The answer and reality is that, it’s much better value for the school to get a number of sports courts marked at the same time. The main reason being the cost of labour. So deciding on the number of courts, what games will be played and ordering them all together will save the school a lot of effort and more money. 3. Existing Courts / Fading Courts. Existing courts can be relined and remarked, in fact the majority of our work is to re line existing courts. The time involved is more or less the same but it may require some additional preparation work. 4. How long after the work are the courts playable? Ideally the courts should be left for 2 full days however most schools use the the courts afters 24hours. 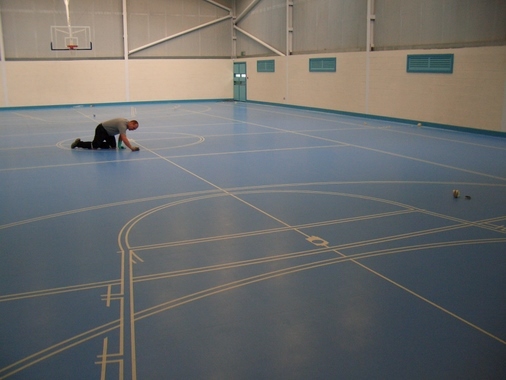 Sports Halls come in various sizes and the line marking professionals selected should be able to resize the courts back to the schools exact requirements. In the case of Primary Schools, the main sports courts may not be needed and as such multi-purpose lining is a much versatile and cost effective option. 7. What surfaces can be lined. The majority of courts to be lined are either timber, vinyl or rubber. Although most professional court markings companies can line mark more surfaces. We line mark all the main surfaces and please feel free to contact us for specific situations. The first item on the Department of Education list for secondary schools sports hall tender packages is gymnastics mats. There are two gym mats currently recommended by the Department of Education for PE general exercises; the PE10A Horizontal Gym Mat and the PE10B Lightweight Vertical Gym Mat. A.) Horizontal Storage type Flame Retardant Gymnastic Mat. 4.5 kg (10 lbs) density reconstituted chipfoam. Bonded cover. Anti-slip base. Horizontal storage recommended. B.) Lightweight Flame Retardant Gymnastic Mats. 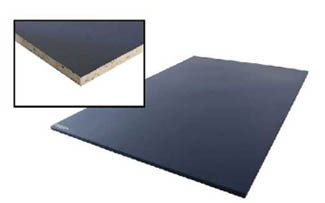 1830 mm x 1220 mm x 32 mm to comply with standard, specification & flame retardancy as above. Anti-slip base. Designed for vertical storage. This gym mat is slightly more costly than the standard school gym mat. 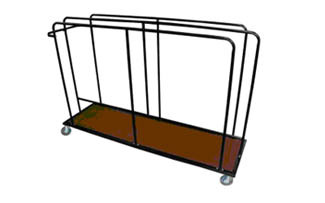 To complement the choice of mats choosen there are two mats trolleys. For Horizontal Storage type Flame Retardant Gymnastic Mat. Flat bed type. 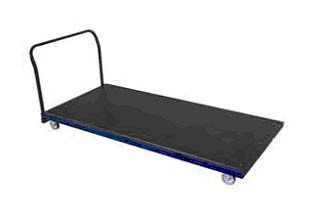 Suitable for transporting 20 gymnastic mats (PE594/10A). Six Non-marking 100 mm x 25 mm ball rack mounted swivel castors. Tubular steel construction with pulling handle. Framework finished with epoxy powder coated paint. For Lightweight Flame Retardant Gymnastic Mat. Tubular steel construction c/w side frames and pulling handle. 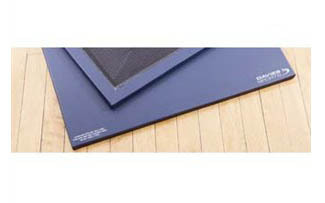 Accepts 10 lightweight mats (PE594/10B). Four Non-marking 100 mm x 25 mm ball rack mounted swivel castors. Brakes on castors on 2 diagonally opposite corners. School Sports Equipment – Dept. of Education Standards. School Sports Equipment – Department of Education Standards. We have been manfacturing suppying sports equipment that meets the Irish Department of Education standards and specifications for almost ten years. We intend to post a grouping of the main sports items fom the 3 main School Sports packages on a frequent basis. We’ll include a brief description, some images and relavant links. If you require additional information or if you would like Fitness Functions to visit your school sports hall, please do not hesitate to contact us. 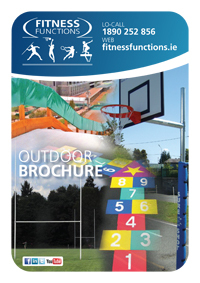 Email our digital marketing manager; niall@fitnessfunctions.ie or visit our website. 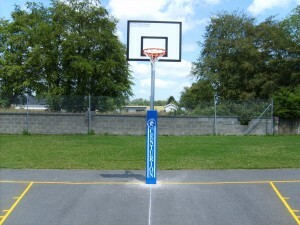 Irish Builders Outdoor Basketball Installation Guide. 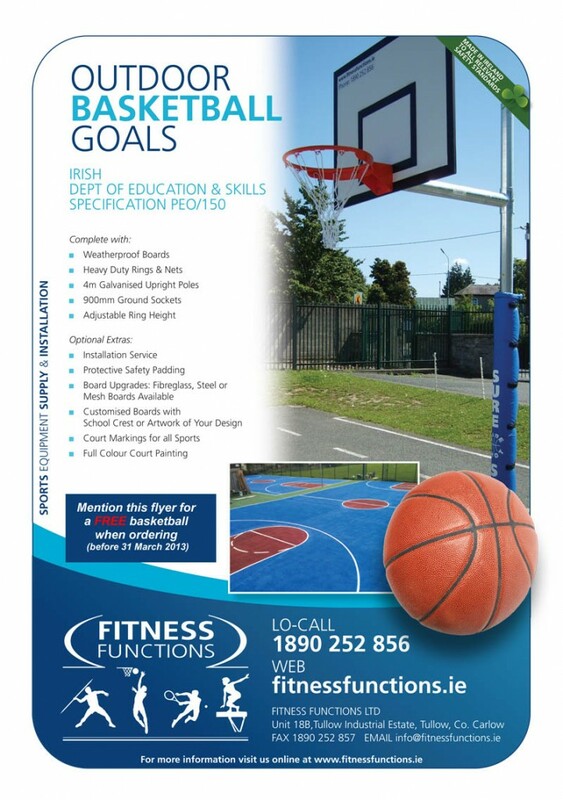 Fitness Functions have supplied countless main contractors in recent years with Outdoor Basketball sets for new build Irish schools & colleges which conform to the Department of Education Outdoor Specifications. As we manufacture these sets in our premises in Co. Carlow, they’re always in stock and ready to ship directly to site. Basketball Sockets Ordering & Delivery. When a Builder places on order for a Basketball set (s) we organise delivery to site. These basketball sockets are often required on short notice especially if theresa new asphalt basketball court involved that no one wants to dig up !! Court size; sockets should be set 28m apart where possible, but at least 1m from end fences/walls. If necessary reduce court size to allow adequate safety runoff. Allow basketball sockets to settle for a minimum of 48 hours before assembling the goals. Two men should assemble the units. First place extension arm over the upright, lock the arm to the pole at approximately 4ft. Now, the board and ring should be attached to the basketball extension arm using the bolts supplied. Ensure the basketball board is level and plumb. Black target box should be towards the bottom of board-top of ring should line up with bottom line of small rectangle box (150mm from bottom of back board). Using a step ladder and bracing bar, bring the basketball board/arm/ring combination to the correct height. Lock the grub screws/bolts into position using allen key/19mm ratchet. To kick start 2013 we are giving away a FREE basketball with every school outdoor basketball set ordered, before the 31st March this year. To claim your FREE Basketball? To ensure you receive your free basketball with your order just mention/reference the flyer below, its that simple. Email: niall@fitnessfunctions.ie OR Phone: 1890-252-856. Click to View Outdoor Basketball Set. About our School Outdoor Basketball sets. 1. Our outdoor basketball is made to strict Department of Education Specifications. 2. We have supplied / installed hundreds of these sets for Irish primary and secondary schools over the past ten years, from Wexford, Dublin and Donegal to Kerry. Outdoor Basketball surfaces & line marking. In addition to our school outdoor basketball goals & padding, we apply basketball court lining and painting (as pictured above) to indoor & outdoor courts. If you require additional, basketball sets, basketball rings or backboard information please do not hesitate to contact us. Email our digital marketing manager; niall@fitnessfunctions.ie. We look forward to your email.